Presentation is a key criteria used to determine the outcome of your interview with Sidekicker. You be having a profile and uniform photo taken in the office, so please come prepared! All of these articles can be found at H&M, Kmart and Target. 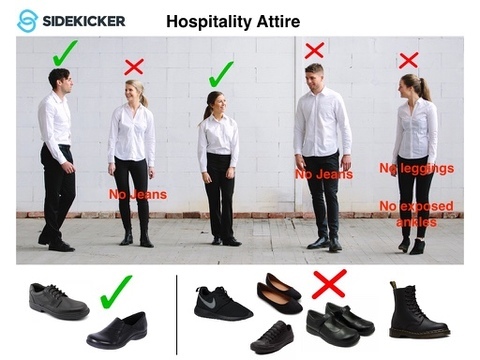 If you do not have a hospitality uniform you will be unable to interview for the role. What if I'm applying for multiple roles? If you are applying for multiple job types, including hospitality, please wear a hospitality uniform (see above).